List of all programs offered. Click on the program name below to learn more about the specific program including an overview and requirements. The Process Technology degree program will prepare students to assume roles as operators and technicians in the process and manufacturing industry (food processing, power production, water treatment, paper manufacturing, fuel production, chemical and pharmaceutical manufacturing). This degree prepares individuals for entry level employment within industry as well as current industrial employees for advancement within the industry. 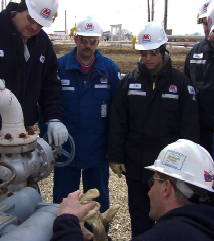 This program was developed with the support of industry personnel from the Crawford County area and includes a partnership with Robinson Marathon Petroleum, LLC.